The forces of Secularism just keep trying. It would be comical if it weren't so dastardly. As our world becomes increasingly anti-Christian, the forces of Secularism are finding that the people that they wish to subject to lives of abject spiritual poverty are becoming proportionally restless in their desires for something more than a pointless materialistic existence. Attempts to soothe this God-given desire for Divine Communion with false Secular religions - such as Socialism, Freudism, and Evolutionism - have all met with failure. The people want Jesus! Seeing this, the forces of Secularism have devised a new stratagem that they hope will stifle a Christian revival: Secular Consumerism. Secular Consumerism seeks to occupy Man's attention with the pursuit of consumer goods, thereby diverting him from seeking the True Good that is our Lord and Savior, Jesus Christ. Secular Consumerism tries to fill the hole in Man's Heart with DVD players and expensive jewelry. Well, dear reader, that hole in your Heart isn't DVD-player-shaped; that hole was made to accept the key of our Lord's Love that your Heart may be opened to Salvation. It is that hole that the forces of Secularism wish to bung up with material possessions. This, they hope, will keep Christianity down and let them continue to foist Secularism on our society. Increased advertising and product placement in all sectors of life (witness the Godless public education system putting ads in their schools - do you really believe they are doing that due to a lack of funds?). Increased emphasis placed on a person's monetary worth and consequent ability to acquire possessions. Prevalent use of the term "consumer" to refer to people and obsessive concern about the state of "Consumer Confidence" - the Secular version of Faith. The co-option of the Birth of Jesus Christ, the very Lord of the Universe, as a device to sell singing rubber fish (more on this below). This is not to say that commercial trade is inherently evil; that is the false doctrine that the failed Secular religion of Communism preached. (One does have to admire the guile of the Secularists - if one false religion isn't working, try the exact opposite!) Instead we must differentiate between the Secular form of Consumerism - where a person is judged when he dies by their collection of things ("He who dies with the most toys wins" proclaims the Secularist's bumper sticker. "Yes, wins an eternity in Hell" says the knowledgeable Christian.) - and healthy, Christian trade - where goods and services needed to live a Bible-centered life are exchanged for money that was earned through ennobling and moral work, and where one is Judged in Heaven by whether they accepted the Christ as their Savior. The former is the road to eternal suffering, whereas the latter is on the road to Salvation. This new false religion of Secular Consumerism has had more thought put into it by Secularists than their previous attempts at social engineering. While holidays were created for their other false religions - May Day for Socialism and Earth Day for Evolutionism - those novel holidays never caught on and consequently did nothing to promote the religions. For Secular Consumerism however, a more devious and ironic plan was put into action whereby an existing Christian holiday was co-opted and transformed into the centerpiece for the Secular Consumerism attack on Christianity. That holiday is of course Christmas. For the sake of any non-Christians who have been deluded by Secularism, let me state clearly the true meaning of Christmas: Christmas is a Christian holiday celebrating the miraculous birth of Jesus the Christ, Son of God, Lord and Savior of Mankind. It is celebrated on December 25 - not Thanksgiving through New Years - because that was when He was born into human form. It is not a "winter celebration" since they did not have snowy winters in Bethlehem, Jesus's birthplace. Nor does it have anything to do with occult Astrological concepts like "solstices". It is about Jesus and nothing else. What the Secularists call Christmas has nothing to do with our Lord Jesus Christ; they only continue to use the name to debase it and also because it tricks naive Christians and would-be-Christians alike into thinking it is a safe celebration. It is instead a cynical - if devious - theft of a Christian holiday for anti-Christian purposes. They hope to use our own holiday to lead people away from the Truth of Christianity and towards the lies of Secularism. This false Christmas is more properly called Santamas, since it is centered around the mythical Santa Claus and his bringing of material possessions as rewards to children who please him (it's not the Lord but Santa, the children are told, that is watching over them and will judge them). As Santamas has become central in the scheme of Secular Consumerism - encouraging people to purchase possessions out of fear of disrupting the "spirit of the holidays", thus inculcating in them the habit of consumerism - Santa Claus has become the religion's figurehead. Being a fictional character unlike Darwin or Marx, Santa is immune to any criticism. But even worse, the Secular media forbades any mention of his fictionalness, citing the damaging effect it would have on the children who "believe in him". Again, this is a very devious move on the part of the forces of Secularism and they have clearly learned from past mistakes. "Move over Jesus - Santa's coming to town" - Shocking report from the secular newspaper Guardian UK that tells how 67% of British children now associate Christmas primarily with Santa while only 8% associate it with Jesus! Includes report of a vicar who was attacked for daring to tell children that "Father Christmas doesn't really exist". Beware America, this could happen to us! "Hey, Santa Claus, Jesus Lives!" - A song by "Backwards boB"
Typical shopping mall filled with hypnotic Santamas decorations. "Darth Maul": Commercialized symbol of evil whose name sounds like "mall". Coincidence? If Secular Consumerism is the new false religion, then its temple is the Shopping Mall. This is where those deluded into Secular Consumerism go and unwittingly take part in anti-Christian activities; this is where the Santamas propaganda and indoctrination are distributed; this is where the moral foundation of our society is being attacked; and this is where we as Christians must go to battle for the souls of the unsaved against the forces of Secularism. J.C. Penny - The J.C. makes us think of Jesus Christ, thus associating our Lord with the lowest monetary value, the penny (even Judas valued Him at 30 pieces of silver!). Sears - What the flesh of the damned does in Hell. It also sounds like "seers", Pagan mystics who engaged in occult premonitions. Cinnabon - Sounds like "Sin Upon". Orange Julius - Named for the Pagan Emperor of Rome. This company's mascot was once a devil, until they changed it to hide their true intentions. Hot Topic - A recent store aimed at children that openly sells devil paraphernalia. Any guess as to why "hot" is in their name? Clearly there are ulterior motives evident. Even the word "mall" evokes evilness being a homonym for "maul" - the violent rending of flesh - and "mal" - Latin for "bad" and root for words like "malicious" and "malevolent". These Malls of the Damned - open even on Sunday! - are no innocent business centers, but active parties in the conspiracy to promote Secularism. As you can see, malls are wastelands of Secularism and anti-Christian propaganda, and those that are driven there by the lies of Secular Consumerism need help to find their way back to the path of Salvation. As Christians, it is our duty and pleasure to help them. That is why we must become Mall Missionaries. Shoppers deluded by Secular Consumerism wandering a mall in a futile search for spiritual fulfillment. In our society - immersed as it is in the cultural war with Secularism - perhaps the most important mission a Christian can undertake is to spread the Gospel to those who are being shielded from its Truth. This is what the Mall Mission intends to do. We will go into the dank belly of the Secular beast and pull out those it has swallowed, delivering them into the daylight of Salvation. Using the best tools available - the Word of the Lord, inspired witnessing, and informational pamphlets - We will bring to those unfortunates the Good News that they are not mere "consumers", that they are instead children of the Lord. Average everyday shoppers in the process of building their collection of material objects. The soft sell is best with these folks. Chat them up about their life and if they feel satisfied. Casually mention that you don't subscribe to "consumerism", but avoid the word "Secular" since it might scare them off. Offer them pamphlets only if they express dissatisfaction. Be friendly and steer the conversation so that you can invite them to your Church. These people are caught up in the "holiday spirit" - AKA Secular brainwashing - and will be very unresponsive to non-Secular-Consumerism ideas. This brainwashing is supported by the use of music and decorations in malls to tap into hypnotic suggestions placed by Secular culture in people's minds over the last few decades during childhood. Some of these people will be nominally Christian - having been led astray from the Lord into the pseudo-Christianity of Secular Consumerism - and you will be able to reason them out of their consumeristic stupor by noting the lack of Christ in their supposed Christmas. The others will be non-Christian and probably antagonistic towards the Truth of the Lord due to further Secular brainwashing. Use a similar approach of asking them if they feel satisfied, but don't take yes for an answer. Press them on the issue, they will soon admit that they feel empty. Now ask them why they are celebrating "Christmas" if they aren't Christians. This will bring them great consternation and they will be unable to provide a reasonable answer. This is your opening to explain the Secular Consumerism agenda and how they can't fill the void they feel with possessions, but only with the Love of the Lord. At this point they will be very emotionally vulnerable and may break down in tears, so be sure to have Kleenex on hand. Finish up by giving them pamphlets and inviting them to your Church. Almost exclusively male. These shoppers are harried and often confused and consequently will be more susceptible to Secular programming. The pressure to consume will have them at a breaking point. Use a very hard sell, appealing to their desire for release from the slavery of Consumerism, and they can be easily snapped. The closer to December 25, the more likely they will be to completely abandon their Secular Consumer lifestyle on the spot. If you are targeting these lost souls, be sure to bring a van so that you can take them back to your Church for counseling and emergency baptisms. Called "Mall Rats" in their nihilistic Secular culture, they can often be found hanging around malls after public school doing nothing constructive. Teens paradoxically desire to be "different" but also to fit in. Use this contradiction to your advantage by pointing out how all the people around them are "tools to Secularism" while offering them the chance to join in the Love of Christ. Emphasize "coolness" of Jesus and offer "Radical Salvation". Secularized teens usually can't read too well, so hand out colorful stickers instead of pamphlets. Perhaps the saddest of the bunch, senior citizens who have been abandoned by their Secularized family and youth-orientated Secular jobs who spend all their time circling malls under the deluded pretense of getting exercise. While they tend to not purchase things, they have still been indoctrinated to think that there is no other place for them to go in their twilight years except the Temple of Secular Consumerism. Let them know that instead of being Mall Walkers, they can be Church Walkers! Your Church can offer these pathetic and lonely people much more comfort than the cold, heartless mall can. As mentioned above, you will need some tools to help you in your mission. First and most important is a sound understanding of the Word of God. If you feel that you are weak in this area, consider buddying up with a fellow missionary more versed in the Bible who will do the talking. Second is witnessing skills. Not everyone has them, though the Lord will empower you with them when you are in need and pray to Him. Most Churches offer witnessing classes and you should take them to at least learn the fundamentals (projecting righteous beatitude, the personal testimonial, identification of unsaved souls, etc.). Professional pamphlets (such as those available from the American Tract Society) will really make an impact on the unsaved! These two tools are basic to any mission you will undertake, so lets look at tools specific to a Mall Mission. Foremost you need pamphlets, literature, and/or some sort of handout. This is important because in a mall situation, those you are missioning may be in a hurry - or at least very destination orientated - and may not have the time or inclination to listen to verbal witnessing. By giving them something they can read at their leisure - either when they get home or while standing in lines at the mall - you will have given them more opportunity to get to know the Lord and hear about the poverty of Secularism. Professional witnessing pamphlets and Bible tracts are always preferable, since the unsaved's eyes have been made cynical by Secularism's slick advertising, however that doesn't mean that homemade handouts won't work. Even an inexpensive computer can produce an inspiring leaflet! "Jesus will save you more than 50%... He'll save you 100%!" "Salvation is one size fits all!" "Why go to a Gap when you can come to Agape?" Voice your concern for the souls of shoppers to store employees. Many employees are themselves victims of Secular Consumerism and will likely see the Light if you explain how the shoppers are being used by Secularism. Encourage them to quit and become Mall Missionaries instead. 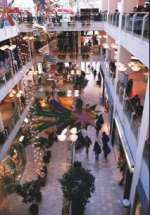 Infiltrate a mall store by applying for a holiday job. Once you are on the inside, discourage shoppers from buying any of the store's merchandise. 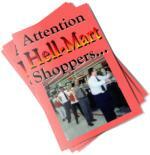 If they insist on buying something, slip informative pamphlets in with their purchase. Hand out Prayer Certificates for shoppers to give instead of gifts. Tell them they make "great stocking stuffers!" Malls are filled with security cameras watched by agents of Secularism, who are in need of Salvation just as anyone else - if not more so! When in view of one of these cameras, hold up inspirational signs and put on pantomime plays for their benefit. Another innovative idea is to stage dramatic performance art on location in the mall. These unannounced plays will seem real to the shoppers around you and can showcase the problems of those who have rejected our Lord in favor of consumerism. Mall missionary being escorted from a mall by a squad of mall security. The mall was forced to allow her back in after she prayed to Jesus for intervention. It would be naive to think that the forces of Secularism would let you try and sabotage their devious plan without intervening. You can be sure that if they realize what you are doing they will try and make you leave the mall. But you should also be aware that those you are trying to mission to may oppose your efforts as well due to Secular anti-Christian programming. The best method to deal with this opposition is subtlety. Don't show up to the mall with a bull-horn and John 3:16 signs and expect everything to go smoothly. Instead, pick out selected shoppers to mission to and approach them in a non-confrontational manner. Try to wear Secular style clothing if possible so that they won't feel threatened and flee. Practice with your fellow missionaries handing out pamphlets so as not to draw attention to the act - small or folded up handouts can be held in the palm and passed to a person when shaking their hand. Also, try and operate in groups no larger than three. What will happen if your activity is spotted? You will probably be approached by Mall Security. Mall security officers - modern day centurions patrolling their own little bit of the Secular Roman Empire - are nothing to fear. They have no real powers and are unarmed. If they ask you what you are doing, tell the righteous truth! Explain to them about Secular Consumerism and its evils. Some of these officers are victims of Secular Consumerism themselves and have merely taken the job to earn money to buy consumer goods, and so you may be able to enlist them in the mission. However, many of these officers have received special indoctrination and are deeply committed to the cause of Secularism. These will probably ask you to leave the mall and not return. 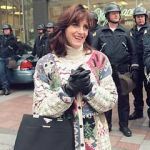 It is important to remember: the mall's law is not God's Law. It's not even Man's law; malls have no authority under the Constitution to deny you your right to freedom of speech. The courts have upheld people's right to pass out pamphlets and demonstrate at malls, citing that though malls are private property, they are also public spaces. And even if this were not so, God commands us to spread His Word to the unsaved, and no earthly agency - much less a mall owner - has the Divine Authority to question that command. If you are asked to leave and all you have been doing is spreading the Word of the Lord, then you are not compelled to do so, not by Man and certainly not by God. If they persist in trying to get you to leave, raise a righteous outcry so that those around you will know that the forces of Secularism are trying to suppress the Truth of the Lord. The agents of Secularism will not want to disrupt their happy little Secular Consumerism fiction and so they will back off. However, at this point your missioning abilities may be compromised since some of the more brainwashed shoppers will be leery of you. Either move to a different section of the mall or call in replacement missionaries. I hope that this will encourage you to get active in opposing the anti-Christian forces of Secularism that are brainwashing our nation through consumerism. Don't let the voice of Christianity - our voice - be drowned out by Secular advertising and propaganda. The Lord wants everyone to hear His Word and it is our duty to make that happen. Now, put your full armor on, get out to those malls and mission!